Los Angeles, California – February 2009 – The annual contact center trade awards were released January 30, 2009 by industry authority Contact Center World. 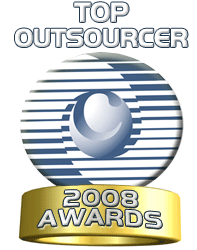 Callbox Sales and Marketing Solutions was awarded the coveted Top Outsourcer trophy of 2008. Callbox also achieved the first place ranking in Percent Growth of Sales Revenue, second place ranking in activity volume, second place in volume of experienced B2B agents, and continued to sweep the breadth of the outbound rankings, by placing in seven separate rankings, ultimately showing strength across four of the five major categories. “This was a worldwide competition and Callbox scored across the board. Callbox works hard to be a world class Top Outsourcer, and now we have the trophy to prove it,” said Rom Agustin, CEO. “Of all the awards we picked up, I’m most delighted by ranking #1 in revenue growth. Of course it illustrates that we have more and more clients. But it also perfectly validates our service, because our own marketing practices brought us that increasing revenue growth, and we use precisely the same techniques for our clients,” added Glen Norris, COO. Callbox is one of the fastest growing BPO companies in the global B2B market, with one of the world’s largest outbound forces. The Top Outsourcer awards and Industry Recognition is a yearly quantitative and objective study of outsourcing companies worldwide by Contact Center World aimed at acknowledging hardworking companies who deserve significant recognition. Specializing in largely business-to-business sales lead generation and appointment setting services, Callbox has been serving the following industries to date: information technology (IT), software, telecommunications, banking and finance, government, insurance, commercial cleaning, and logistics. Now recognized as a Top Outsourcer of outbound services, Callbox is gearing itself for further recognition in the blended category (Outbound and Inbound).